Reserve the Madame Tussauds' Package! See famous figures like all 44 US Presidents including Barack Obama, plus Madonna, Beyonce, Rihanna, Britney Spears, Angelina Jolie, Brad Pitt, Samuel L Jackson, Jennifer Lopez, Robert Pattinson, and many, many more! Madame Tussauds' is located at the corner of 10th & F Streets. Wax Museum hours of operation: 10 AM to 6 PM daily, 365 days a year. Extended hours may be available during peak seasons. Contact the museum at 1-888-Wax-in-DC or visit Madame Tussauds' website for hours and information. The package includes admission to World Famous Madame Tussauds' Wax Museum in downtown Washington DC for 2 adults and 2 children plus voucher for 2 adult breakfasts - Kids Eat Free. Value of admission tickets and breakfast over 100 dollars! 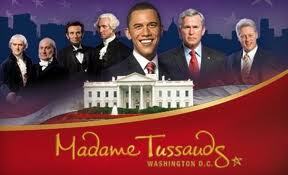 Reserve the Washington DC Wax Museum Package. Value of adult breakfast voucher is 20 dollars. Breakfast available in restaurant only - may not be used for room service. No credit or refunds for unused portions of package. Package components have no cash value. Only 1 set of museum passes per stay.